Upon arrival at Soekarno Hatta, you will be met by our guide and Transfer to FM Resort Hotel, near Airport. made in our life time (the oxygen come from the process of the tree photosynthesis during a day time is the payment of the Carbon we made). This program cooperated with the national park. Back to the boat. Lunch will be provided on board by our own cook. Afterward boating down to Tanjung Harapan to see the local activities, if you want to do local spa with the herb you could do it here on your own budged. 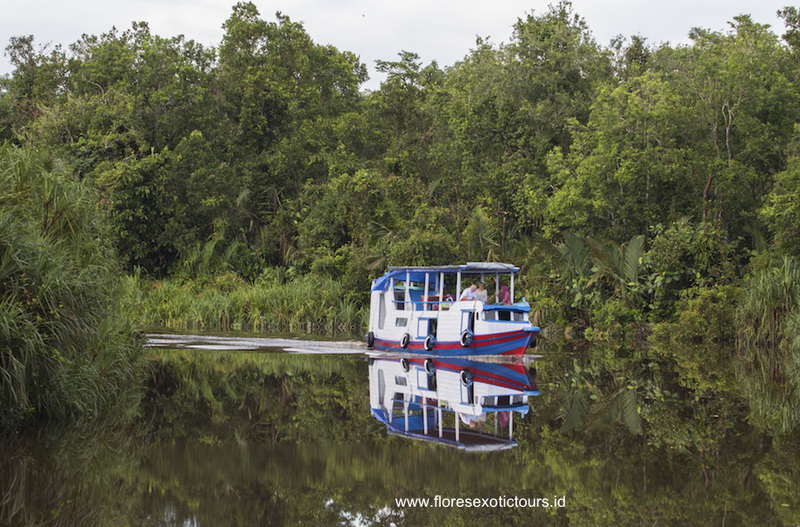 Back to the boat and boating down to see Proboscis monkey. Dinner and overnight on board. After breakfast transfer by car to Pangkalan Bun airport and flight via Banjarmasin to Balik Papanb, arrival in BalikPapan, transfer to the hotel. Overnight at Hotel Grand Senyiur Balik Papan. Early in the morning by motorcanoe upstream Sangatta River into the jungle of Kutai National Reserve. Upon Arrival at Prefab Orangutan Research station, we will drop our stuff and direct start a jungle trek into the forest, looking for wild life and Orang Utans, which are completly wild. Afternoon return to Prefab Station for Lunch and rest, late afternoon another forest trek searching for wild and experience the beauty of the Rainforest flora and Fauna here.Dinner and overnight at Prefab Research station. After Breakfast hike into the jungle of Kutai National Reserve, to get a last glance of it’s jungle, before we leave to Muara Wahau, Lunch on the way, visit the Long Ear Dayak Kenyah at the old longhouse at Miau Baru village, check in at guesthouse. Evening possibility of Dayak performance upon request. After Breakfast, visit the Tropical Forest of Wehea which is a 38000 hectare of production forest of the Dayak people at Muara Wahau area, the diversity of flora and fauna with 60 kinds of tropical rain forest trees, and more then 100 wild life species can be found here, as orangutans, deer, and many kinds of birds. Lunch en-route, overnight at guesthouse. After breakfast transfer to Berau, on the way we bring a short visit to Miau Baru Dayak Kenyah village, with an old art longhouse, and possibility to meet Long Ear Dayak women, continue overland to Berau harbor to boarding a boat and cross the Sulawesi Sea to Derawan Island. Check in at Lodge, or Resort, Lunch, afternoon possibility for snorkeling or Derawan village sightseeing. Early in the morning by fishermen’s boat to Sangalaki Island which is called the Capital of The Mantas Rays, many kinds of exotic fish could be seen in this area like the Mantas, Napoleons, purple sea horses, tunitates, dwarf scorpion fishes, and not to forget the Coral Sea Garden which is still in tact. In the night we could explore the Turtle bay. After breakfast start our trip cross the sea by fishermen’s boat to Berau for your flight to Jarta or next destination.